The following was sent to my email newsletter earlier today—to receive content like this right to your inbox, about twice a month, subscribe. You may have seen the amazing video of UCLA gymnast Katelyn Ohashi absolutely nailing her floor routine—with precision, energy, and sass. If you haven’t, please check it out, and the Washington Post story about this amazing athlete. What really caught my attention is how Katelyn Ohashi stepped back from training to be on the Olympic elite level because it was breaking her body and spirit. She decided to focus on her college career instead, and have fun doing it. Obviously from the video you can tell, she's still pretty damn elite. There's a sermon in there about going for our joy even when it's not what society says should be our joy. I need that sermon, as I’ve gotten myself in a bit of trouble with Yes-And lately. Many of you know Yes-And as the cardinal rule of improvisation—we receive what is offered on stage (or in life) and build on it in some way. I’ve written about this, I speak about it, and it’s the place where I start in God, Improv, and the Art of Living. And it’s something I still get turned around about. Too often, Yes-And becomes an excuse to add more and more to my schedule without removing anything. We had our first snowfall in the DC area this past weekend, which meant a snow day for my kids on Monday. Meanwhile I had a number of phone calls scheduled, and a lot of “thinking work” I really needed to do. Now, my kids are old enough to entertain themselves, and also entertain one another. I could have made those calls. I could have sequestered myself for a couple of hours and gotten the work done, popping out from time to time to make sure everyone was OK. And I have done that—it’s a staple for working parents, and a Yes-And of a sort… to say “Yes, this is a lot, and I’m going to embrace the chaos, juggling these handfuls of Jello as best I can, and being kind to myself when some of it splishes through my fingers.” A full, abundant life is a gift. But for whatever reason, this time I took my own internal temperature, looked at the bigger picture, and Yes-Anded in a different way. I rescheduled my calls and subbed in some less taxing mental work. This enabled me to help my eldest with a looming school project, consult with the middle child on making the traditional snow-day pocket pies, and when my youngest came back in the house, stomping snow boots and shedding gloves and coat, I was ready with the hot chocolate. Most importantly, I saw this as a faithful expression of who I am and who I wanted to be that day. Now, as Kathryn points out, Katelyn Ohashi is still performing at an extremely high level. But too often, our culture looks at people who take a step back in terms of what is lost. Maybe Ohashi will not end up at the Olympics as a result of her choice... but it’s clear from that performance how much has been gained. Sure, sometimes Yes-And is a process of sheer addition, and making it work imperfectly and beautifully. But other times—maybe more often—it’s about subtraction. Clarification. Deepening. One of my favorite follows on social media is elite runner Tina Muir. Tina is a serious athlete, logging hundreds of miles a month, and winning and placing in all kinds of races (she won the Army Ten-Miler here in DC in 2015). A couple of years ago, she left running altogether—arguably at the pinnacle of her own physical conditioning—because she hadn’t menstruated for nine years and had simply had enough of putting her body through that. She and her husband Steve wanted to start a family. Now, a couple of years later, she has a baby daughter, Bailey. She’s training again, but she trains differently. Her body has changed. She logs a bunch of her training miles with a jogging stroller. The demands on her life are more complicated. She’s also happier than she’s been in a long time. 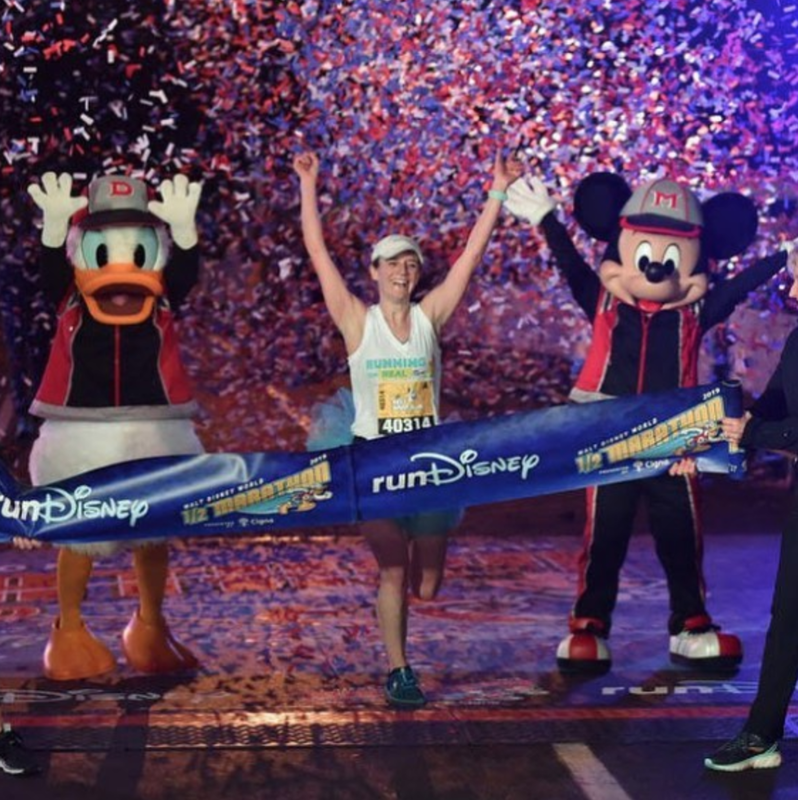 She entered this weekend’s Disney Half Marathon with no expectations, but determined to run the 13.1 miles as best she could—to run them hard, and to run them joyfully. ...Now, just because you Yes-And and shift priorities and embrace the journey and all that stuff doesn’t mean you’re going to “win,” whatever winning means in your context. Results not guaranteed; this isn’t a formula. But using Yes-And as a way of aligning with your deepest purpose means that winning no longer matters. The joy is its own sweet reward.